When you sit down to watch some TV, do you often find yourself checking email, updating your social network statuses, browsing product information, checking sports scores, or performing a variety of other tasks on your smartphone or tablet? If you answered yes, you are part of the majority. Nielsen conducted a survey of device owners in the U.S., U.K., Germany, and Italy. 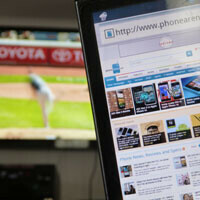 It found that, not only is device usage while watching TV a growing trend, it is also more common than not. When asked about the last 30 days, 88% of U.S. tablet owners and 86% of US smartphone owners reported using their device while watching TV at least once. Those in the U.K. weren’t far behind at 80% of tablet users and 78% of smartphone users. 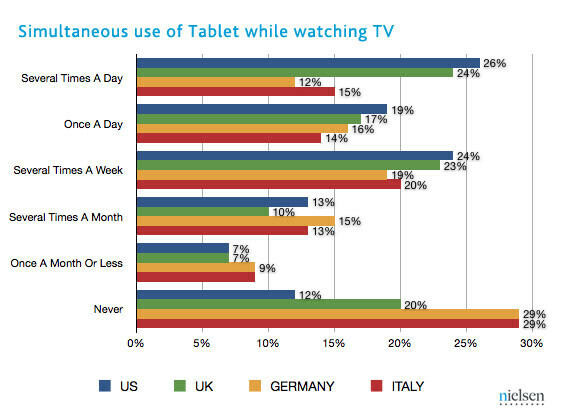 While it still occurs, the practice was much less prevalent in Italy and Germany where 29% of users said they had never used a tablet while watching TV. 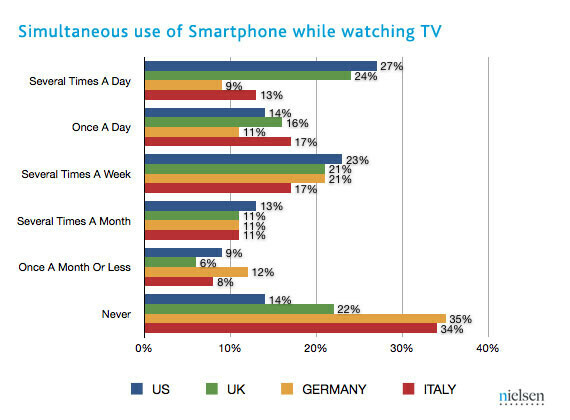 34% and 35% of Italians and Germans, respectively, said they had never used their smartphone while watching TV. I do this all the time ha ha. I'm always on my phone or tablet while I watch tv. Me too,I always read Newsmax.com on my iPad while watching Fox News. I stay on my kindle fire while watching Tv. My laptop just sits.